[New for 2013] I love coolattas, well, I love strawberry coolattas and I long for the day when another coolatta takes it's rightful place as a worthy successor to my beloved favorite. There have been plenty of imposters, coolattas that lacked the fruity puree that makes strawberry so special. Well, on the way to work what do I hear but the traffic being brought to me by the new berry blast coolatta. Yeah, I'm excited. 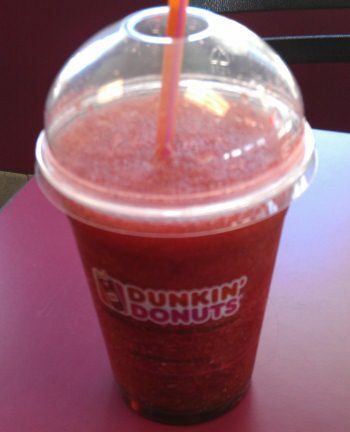 So here is the new Dunkin Donuts Berry Blast Coolatta. Now the ingredients are: Frozen Neutral Base: Water, Neutral Base (Sugar, Glucose, Fructose, Silicon Dioxide, Malic Acid, Xanthan Gum); Berry Blast Coolatta Concentrate: Filtered Water, Pomegranate Juice Concentrate, Acai Puree, Natural Flavors, Citric Acid, Blueberry Juice Concentrate, Xantham Gum, Ascorbic Acid, Red 40, Blue 1. Wait, when I think berry blast I think strawberry, raspberry, and blueberry, I don't think of pomegranate and acai. If you see an employee wearing the new berry blast t-shirt, it looks like blueberries, strawberries and raspberries. Wait, the new raspberry lime coolatta doesn't list raspberries directly either. Ohhhh, it's the old "natural flavors" trick I guess. Ok, I'm ready to proceed, especially since a small is on sale for $1.99. Looking at the picture again, it's darker than a strawberry coolatta and as expected.... it's not really named appropriately. I know the name isn't as catchy, but this is a blueberry pomegranate coolatta. That's how it tastes, plain and simple. Now that's not to say it's bad. I actually think this one has potential to catch on. Rather than the artificial flavoring of so many forgotten coolattas, this one does rock a natural taste. The naming problem is that the people who would like it might be afraid to try it, and the people willing to try it are likely to be looking for something else. UPDATE: both the new TV commercial and the new radio spot emphasize that this is blueberry and pomegranate flavored. It's a tough game companies play when trying to keep us interested in coming back for more. I love coolattas but that doesn't mean I need one every day (once or twice a month is fine by me). I want you to know they did try with this coolatta, it's just not the flavor profile I was looking for. At some point I'm thinking I might try to have them make a half berry blast / half strawberry coolatta. That might be interesting.... or terrible. Only one way to know for sure. Notes for spring 2013: The blue raspberry coolatta is back, the tropicana orange coolatta is now the minute maid orange coolatta, and there is a new (green colored) raspberry lime coolatta that frightened me it's color but is actually a fun summer drink. Update: I find it terribly amusing that the promotion of this treat totally died off and DD's focus was completely switched to the much better raspberry lime coolatta.